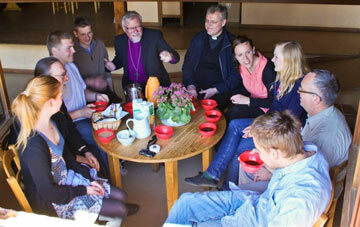 A delegation of the Norwegian Council of Churches visited Taizé from 8 to 11 April. The delegation included Father Johannes Johansen (Orthodox, of the Constantinople Patriarchate), Pater Arne Marco Kirsebom (Catholic, Vicar General of Oslo Diocese and parish priest at St. Olav’s Cathedral) and Bishop Ole Christian Kvarme (Lutheran) Bishop of Oslo. The church leaders were accompanied by five young adults from different churches.